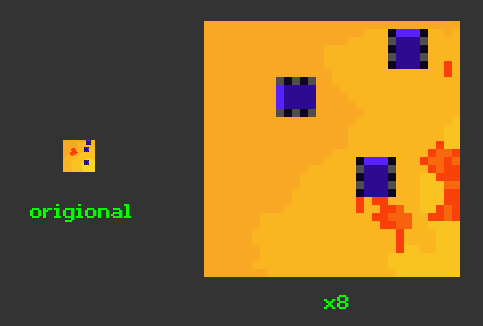 So #LowRezJam is all about fitting a game into a 32×32 screen. Sounds fun and potential painful at the same time. I thought I’d post some progress updates to keep myself motivated and to give me some ponder time while writing blog posts. I’ve had an idea I’ve wanted to do for a while, which is basically a simple resource harvesting game. I prototyped some ideas a while ago, and have worked out how to adjust them to make them fit within the constraints of a 32×32 screen – some of the more complex functions I may have to drop, but it should still be fun. 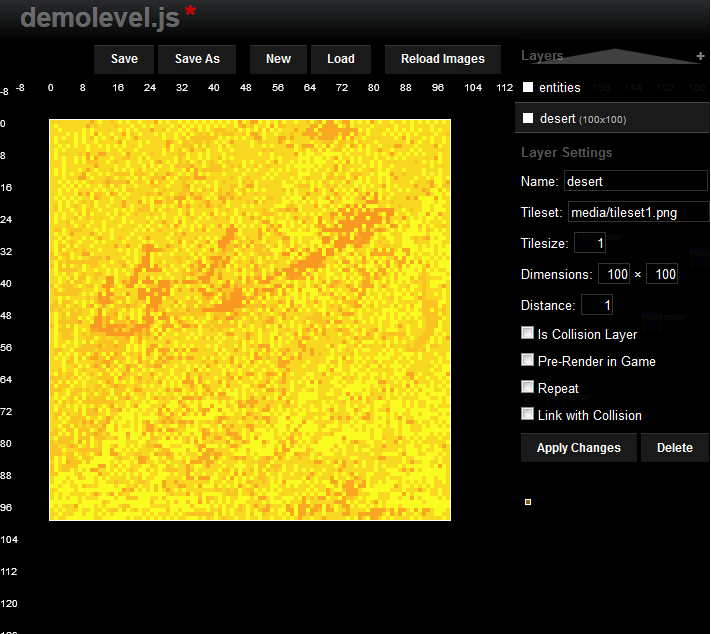 This worked fine, but building static levels like this struck me as a bit boring. 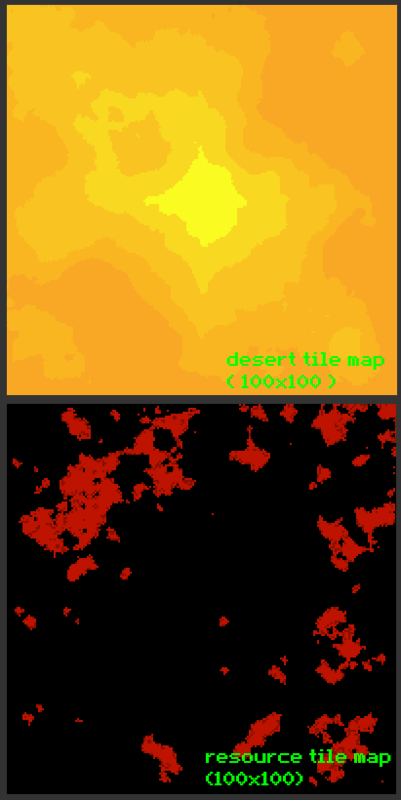 If in doubt I try and use procedural generation as much as possible so I decided to do that instead 🙂 I tweaked the game to have to distinct map layers – the first one contains the desert environment, the second will contain the resources that you are collecting. 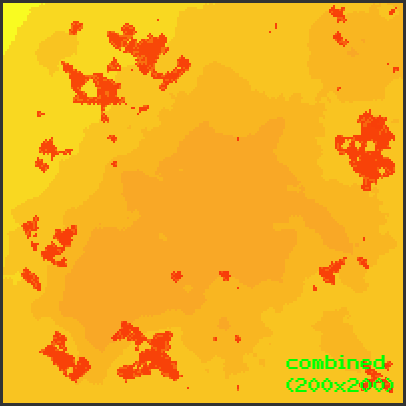 I used the diamond-square algorithm to generate some realistic looking desert and the resource layer. 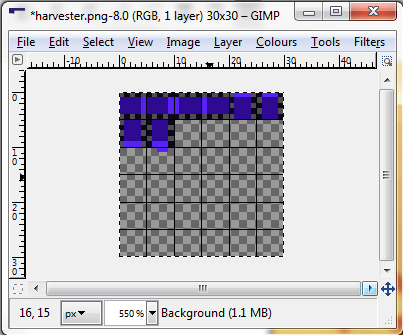 30×30 for the full tilesheet – lots of unused space for now and easily the smallest tilesheet I’ve made. Why on earth gimp says 1.1MB I have no idea 🙂 So now, we combine these all together, and stick them in the 32×32 frame. This initial prototype was just to see if it would all work as expected, so the harvesters just randomly move up and down and left and right, and the screen is scrolled by the arrow keys – this is the up-scaled version, next to the original size. This entry was posted on Saturday, May 3rd, 2014 at 3:32 pm and is filed under GameJam, LowRezJam, Random Thoughts. You can follow any responses to this entry through the RSS 2.0 feed. You can leave a response, or trackback from your own site.